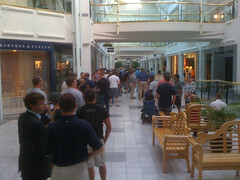 Back of the line, Apple Store Green Hills, Nashville. Madness as ever at an Apple launch event. Much like my iPad I'll be back around 3pm or so to collect my reserved phone. Pre-orders were actually a longer line at this point, however walk-ins had gone ahead by the time I left. See also the front of the line. Oh, and we "may" be driving from Chicago to Ocean Isle at the end of July, so will pop in and say hello if we are. Please do! It would be lovely to see you. There's a spare room if you'd like it.